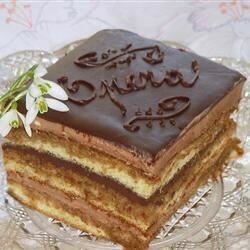 "I first tried this at baking school, and I became addicted to it...it is a layered dessert of a thin cake with ground almonds, filled with ganache and coffee buttercream, and topped with more ganache. It's a lot of steps, but well worth the effort. You can make all the parts a few days in advance and store, tightly covered, in the refrigerator. Just be sure to let the buttercream and ganache soften for a while at room temperature before spreading." Preheat oven to 350 degrees F (175 degrees C). Line the bottom of two 10x15 inch pans with parchment paper. In a large bowl, beat 12 egg whites, gradually adding 3/4 cup sugar, until stiff. In a separate bowl, beat together 10 eggs, ground almonds, confectioners' sugar and pastry flour until smooth. Stir in melted butter. Fold in beaten egg whites. Spread batter evenly in prepared pans. Bake in preheated oven 10 minutes, or until center springs back when lightly touched. Invert cakes onto wire racks and remove parchment. Let cool completely. For the buttercream, combine 1 1/4 cups sugar and 3/8 cup water in a small saucepan over medium heat. Heat to between 234 and 240 degrees F (112 to 116 degrees C), or until a small amount of syrup dropped into cold water forms a soft ball that flattens when removed from the water and placed on a flat surface. While the syrup is heating, begin beating the 3 egg whites with an electric mixer on medium speed. When syrup is ready, increase mixer speed to high, and pour syrup into egg whites in a thin stream. Continue to beat until mixture is room temperature. Beat in butter, a little at a time, and coffee extract until smooth. For the ganache, bring cream to a boil in a small saucepan over medium heat. Pour over chopped chocolate and stir until all is melted. Let cool in refrigerator. To make the coffee syrup, combine 1 cup sugar with 1 cup water in a small saucepan. Bring to a boil, then reduce heat and simmer 1 minute more. Stir in instant coffee until dissolved. To assemble the dessert: Cut each sheet of cake in half. You will use 3 halves for the layers of the Opera -- reserve the fourth for another dessert. Place one cake layer on a flat plate. Soak with half of the coffee syrup. Spread with half the ganache to make an even layer about as thick as the cake layer. Top with another layer of cake, soak it with coffee syrup, and spread an even layer of buttercream over that. Top with third cake layer. Chill in refrigerator 1 hour. To finish, heat remaining ganache in a double boiler over simmering water until liquid. Place Opera on a rack over parchment paper and pour ganache over top, completely covering surface, using a spatula to spread if necessary. Chill in refrigerator until ganache is firm, then trim sides of Opera and cut into 8 slices to serve. See how to make a beautifully delicious Yule log for Christmas.